Villa Sea Breeze is an attractive 3 bedroom property located just below the village of Mousatta, in the Trapezaki countryside. 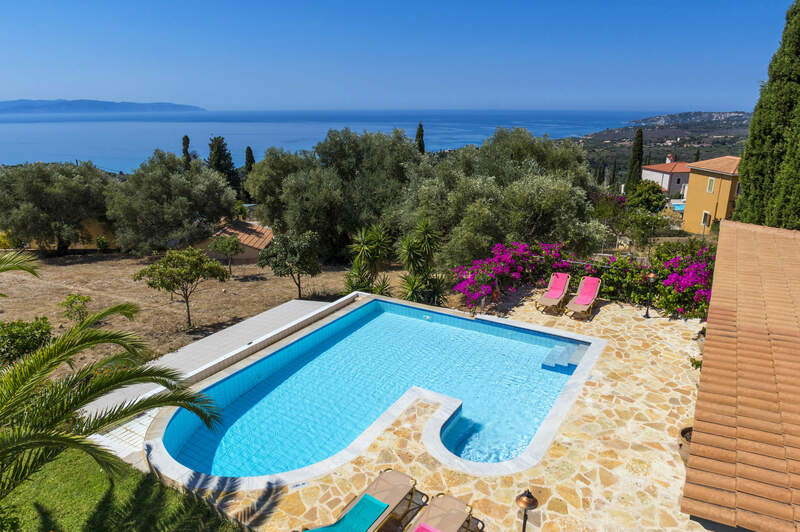 Set in mature, colourful gardens, the villa offers wonderful views across the Ionian Sea to the neighbouring island of Zante. The centre of Trapezaki, with a selection of restaurants and a beach, is just 5 minutes' drive away. The island's capital, Argostoli, can also be reached in 20 minutes' by car. Pool heating, WiFi and air conditioning/heating in all the bedrooms and lounge are included. The inviting private pool, colourful gardens and great sea views all combine to make Villa Sea Breeze a superb choice! The inviting private pool is surrounded by a traditional stone patio dotted with sun beds, offering a great spot to unwind or top up on your tan in between refreshing dips in the pool. The well-maintained gardens keep the pool area colourful and provide additional privacy, but still offer glimpses of the sea beyond. There is a covered terrace with stylish wicker furniture, perfect for a sunset cocktail. The dining table and chairs are great for alfresco meals with a view, cooked on the brick BBQ. The villa is accessed from the large private driveway, where there is plenty of off-road parking for your hire car. There is a spacious, open plan kitchen, lounge and dining area, with patio doors opening on to the pool terrace. The room is pleasantly furnished with an L-shaped sofa, feature fireplace, flat screen TV and a dining table with chairs, creating a sociable space. The kitchen has light wooden cabinets and is fully equipped for your holiday meals. Large windows overlook the front of the villa. On the ground floor is a twin bedroom with en suite shower room and patio doors opening out to the pool terrace - great for jumping straight in the pool in the morning! There is also a separate WC on this level. Upstairs you'll find a further twin bedroom and a large double bedroom, both with en suite bathrooms. These bedrooms both have their own private balcony overlooking the pool area below and the spectacular sea views. All of the bedrooms have fitted wardrobes with ample storage space. This villa is registered and licenced by EOT Greek licensing association. This number is: 0830K10000837901. Villa Sea Breeze is a detached property located just below the village of Mousatta, in the Trapezaki countryside. Set on the Argostali to Skala road, you'll have easy access to both of these resorts. There are a couple of tavernas and a mini market just a couple of minutes downhill walk from the villa, and the centre of Trapezaki is just 5 minutes' drive away. Here you'll find a few local tavernas and bars, a couple of mini markets and a lovely beach. The nearest mini market is less than 700 yards from your villa, as well as a local bakery, so you'll be well stocked on your holiday essentials. The nearest supermarket is around 10 minutes' drive away, on the road to Argostoli. For an even greater selection head to Argostoli, 20 minutes' drive away, where you'll find some good clothing and souvenir shops as well as a local fruit and vegetable market. There are a couple of local tavernas just a short downhill walk from your villa, serving traditional Greek cuisine. The centre of Trapezaki has a few more tavernas, and the nearby resort of Lourdas, 5 minutes' drive away, has a some more options as well as great bars with a relaxed atmosphere. Trapezaki Beach is a small sandy beach with sunbeds and umbrellas to rent during the high season. The sand shelves slightly, making it a great option for families, and there is a local taverna serving lunches. If you're feeling active you can walk along the coast to Lourdas Beach, known as one of the most beautiful beaches in Kefalonia. The long sand and shingle beach has sunbeds and parasols to rent. The best way to explore Kefalonia's beautiful coastline is from the water. Why not hire a boat , take a picnic and be your own skipper for the day? There are loads of pebbly coves and secluded bays all waiting to be discovered. Argostoli, the island's captial, is only 20 minutes' drive away and is well worth a visit for the shopping alone. Head in the opposite direction and it's a 40 minute drive to Skala, where you can explore the old village. Set up in the hills, there is a self-guided trail around the old village, taking you to the ruins of an old Roman villa with spectacular mosaics, as well as the ancient walls of the village. Trapezaki is a great base for walking, cycling or horse riding, offering you an alternative way to the explore the beautiful countryside. Take a look here at the Kefalonia villas that are currently on sale. Villa Sea Breeze is not available to book for season as it is sold out. Take a look here at the Kefalonia villas that are currently on sale. The nearest riding schools are located near Sami and Lixouri where you can learn to ride, improve your skills or simply enjoy yourself. There are mountain trails and beach riding to swimming with the horses. In Kefalonia the unique wine, Robola, is grown and produced. A harmonious white wine of high quality, it is one of the most well known wines in Greece (Hellas). Its wonderful balanced taste, strong note and unique white colour are just a few of the qualities which have established its reputation world-wide.The cultivation of this particular grape is known to be really hard work on the slopes of Mountain Ainos, where the soil is poor and stony, and vineyards can be found as high as 800 m.
The winery is open from 9am to 8.30 pm and is well worth a visit. Agios Gerasimos is the patron saint of the island. On its feast day, the monastery is swarming with pilgrims. According to tradition, he was born in Trikala of Korinthia and was a member of the famous Notaras family. He became a monk and spent twelve years in the Holy Land and five years in Zakynthos. He came to Kefalonia in 1560 and stayed in the cave of the same name, south of Argostoli. Later, he founded the monastery and took residence there until his death on 15 August, 1579. Two years later, on 20 October, 1581, his relics were placed inside the monastery. He was canonized in 1622. At the courtyard, there is a big plane tree and a well, which is said to have been dug by the saint himself. Inside, there is a trap-door where he is said to have spent the greater part of his life. On the 15th of August and the 20th of October, big festivals and processions take place. Many miracles are connected to the saint's relics and icon. The medieval castle of Agios Georgios is situated near the village of Peratata, on a 320m hill. The castle was built in the 13th century to fortify the island's old capital which was housed here until 1757 AD. The castle owes its name to the large church of Agios Georgios, which is situated in the region. The castle, along with the island, fell in succession into the hands of the Byzantines, the Franks, the Turks and the Venetians. On 24 December 1500, after a persistent battle with the Venetians, the Spanish and the people of Kefalonia, the castle was liberated from the Turks. The severe damage to the buildings led to a restoration supervised by the mechanic Tsimaras, which lasted for four years. Until the earthquake in 1636, the castle thrived and housed storage rooms, a hospital, barracks, private residencies and a prison in which the more liberal people of Kefalonia were kept, whom the current conquerors considered dangerous. The Castle's entire surface area is 16,000 square metres, and the walls are 600 m. long and 1,015 m. high. The three ramparts face Argostoli, the East and Peratata, respectively and includes loopholes, observatories and cannon positions. Inside the Castle, its possible to gaze at the tower called "Old Fortress" as well as part of the walls and underground arche. There is, in addition the throne of the Venetian Lord and a catholic church, where the nobles of Kefalonia were buried. Hiring a boat is a fantastic way of exploring Kefalonia's coastlines. A licence is not required, nor do you need previous experience as novices will receive introductory instruction in boat handling before being let loose. Watersports, yacht charter (skippered or bareboat), scuba diving and riding are also available. Based in the Southern resort of Skala, "Nautilus" is a specially constructed boat of high standards. Due to these high standards there is little movement in the boat, which is absolutely necessary because of the glass bottom. The possibility to watch the seabed, to view the rocky coast or to cruise the Ionian Sea waters at a speed of up to 30 knots, feeling the breeze and the sea very close will ensure a pleasant cruise. Located in the area of Karavomilos near Sami, lies the Melissani cave which is undoubtedly among Kefalonia's most breathtaking attractions. Discovered in 1951 by speleologist Yiannis Petrohilos, Melissani cave also includes a beautiful lake with crystal blue waters which is 22 metres below ground level and its maximum depth is about 30 metres. The complete tour is done by boat, first making a round trip around the first hall with the hole in the roof. Then the boat passes the island on the opposite wall, where a small channel exists. This channel is too narrow to row, but there is a rope at the wall and the gondolier pulls the boat through. The second hall is a huge cavern with an arched roof, which was also formed by a collapse, but this cave is more to the centre of the island and because of the slope of the hill, the overlying rock is still thick enough. The second chamber has numerous big stalactites and stalagmites. Drogarati's Cave, which is also close to Sami is 60m deep and was discovered 300 years ago, when a part of it was destroyed because of a strong earthquake, and so the entrance was created. Initially the cave was developed and used by the community of Haliotata, under the supervision of the speleologist Mrs. Petrocheilos and since 1963 it has been open to the public. Fantastic views, great pool and lived up to its name with a very welcome sea breeze.